We’re now 19 days away from Christmas Day, its arrival hurtles toward us with ever increasing speed as the days of December fall by the icy wayside. If you wake to open your advent calendar on Saturday 7 you may possibly find an unusual character hiding behind the tiny cardboard door once you have removed it from its perforated hinges. A dame perhaps? Or a cow? Maybe even a beanstalk… This is because December 7 is World Panto Day which celebrates everything pantomime. Despite this celebration of our Great British pantomime news stories have once again cropped up about the decline of many panto traditions, such as having a female lead as the principal boy, including song sheets and even the character of the dame. But nothing could be further than the truth here in Oldham as the Coliseum’s production of Jack and the Beanstalk sticks to the long-survived roots of panto and tellingly, is still as popular as ever with audiences seemingly getting louder with each show. The Coliseum panto is a traditional affair in that it survives many of the aspects of old but there has never been a true set formula to any panto show. Some traditions exist and others are forgotten whilst new ones are forged through modern culture and technology. Sticking to the traditional roots of where panto originated is something we will always do with our festive shows here at the theatre. After all pantomime wouldn’t be pantomime without alluding to its theatrical tropes. In the interests of making familiar stories entertaining and current though we also have to keep them fresh and embrace the new. 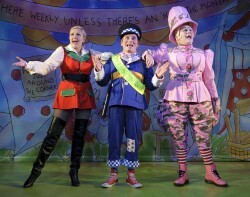 Good seats are still available for Jack and the Beanstalk but are quickly being snapped up. Don’t miss out on catching this traditional pantomime – buy tickets on our website or ring our box office on 0161 624 2829.